Kennedy Space Center (KSC) and Michoud Assembly Facility (MAF) technicians and engineers are working hard to replace, repair and modify numerous stringers on Discovery’s External Tank (ET-137), as NASA managers negotiate with their European partners on the upcoming ATV-2 mission, with an aim to allow Discovery to track a February 24 No Earlier Than (NET) launch date target. Despite complaining about her impending retirement via a number of technical issues, Discovery has been well behaved since the problems arose with her partner in crime, ET-137. The orbiter has not suffered from an additional Interim Problem Report (IPR) for a number of weeks. 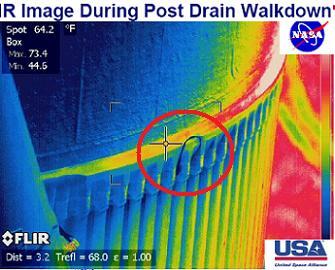 Although the November 5 launch attempt was scrubbed due to an unacceptable leak from the tank’s Ground Umbilical Carrier Plate (GUCP) – a problem which has since been resolved – the crack observed on the LO2/Intertank flange following the scrub proved to be the opening observation for a more troubling issue. With a number of cracked stringers found underneath the cracked foam, ET-137 had effectively been under repair for the past two months. However, an end is finally in sight, as the cracked stringers are replaced with “doublers”, while radius blocks are being installed on all the remaining stringers. Currently, work is being conducted on the areas which were home to three additional cracks – found via scans of the entire circumference of the tank – a repair process which has not been without issue. “OV-103/SRB BI-144/RSRM 112/ET-137 (VAB HB-1): ET-137 Stringer Investigation/Repair: Panel 6: Stringer S6 was match drilled incorrectly on the bench but will be used for the repair. Installation is currently on hold for additional mold impressions requested on RH (Right Hand) side hole #4,” noted the latest NASA Test Director (NTD) report (L2). “Panel 2: The foam applied to the former instrumentation area failed adhesion pull tests on the witness panels after the cure. The foam closeout was re-sprayed Sunday and is currently in cure. Panel 3: Foam application to the area that was instrumented for the tanking test was performed Sunday evening and is currently in cure. Although NASA managers finally signed off on the radius block installation for the outstanding strikers on Monday, the decision was never in any real doubt, following the Program Requirements Control Board (PRCB) meeting late last week. As such, engineers had already began removing foam on Monday morning from the areas covering the additional 108 stringers which will receive the radius block modification. Many could be forgiven for losing track on just what will be conducted on the tank following the latest PRCB overview, which prompted MOD managers to provide a helpful overview of the current situation with ET-137. “The team investigating the cracks in the ET stringers have been working non-stop since November. Discovery was rolled back to the VAB (Vehicle Assembly Building) after the tanking test. 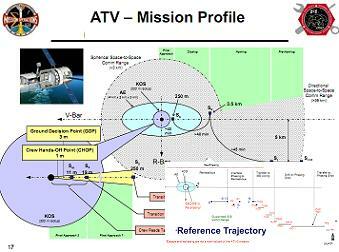 Once in the VAB, they were able to NDE (Non Destructive Evaluation) the entire perimeter of the ET,” noted Flight Director Brian Lunney in the e-mailed overview (acquired by L2). Interestingly, sources note that the Structural Analysis and Testing TIM (Technical Interchange Meeting) at MAF has been delayed to Thursday and Friday, due to winter storm weather in the area. The delay shouldn’t effect any pressing decisions, given the tank will require several days-worth of modification work. The delay will, however, slightly effect the drive towards a root cause, which remained as classed as an Unexplained Anomaly for some time, despite a leading candidate being found when observations of “mottled” material was analysed on samples on at least one of ET-137’s failed stringers, along with one of the stringers on MAF’s part built spare tank, ET-139 – built from the same suspect material lot. However, SSP manager John Shannon has since confirmed they are confident they have root cause via this issue and assembly stresses. “Testing is designed to confirm the material properties of the cracked stringers, as well as of other stringers still available at MAF. During this testing, it was observed that some of the spare stringers have a “mottled” appearance that is distinctly different than the rest of the samples,” added the MOD overview. 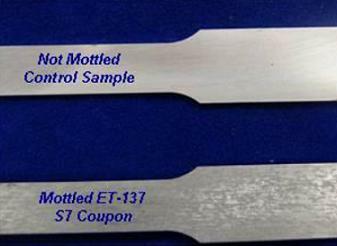 “The “mottling” is not particularly consistent from sample to sample. Some have more or less mottling and sometimes its only on certain parts of the sample. This is relevant because several of the mottled samples that were tested came up with reduced fracture toughness and overall load capability. In addition, the non-mottled samples, when tested to failure, do not crack in the same location/manner as the stringers on our ET. The overview also provided an insight into the thinking behind the decision to press ahead with the installation of radius blocks, in order to provide the additional margin on the stringers, thus reducing the opportunity related foam liberation events during ascent. “Some of the early theories suggested that the cracked stringers could have been caused by stresses induced during manufacturing. In particular, the stringers that were located in positions that required additional structure behind them (doublers) were thought to be particularly susceptible to this possibility. 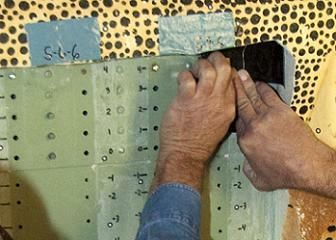 Therefore, the repair team at KSC was preparing to add “radius blocks” to the stringers with doublers. “The fact that two of the -Z stringers that cracked were not on doublers and that the testing of the mottled material is causing a positive evolution of the working theory to explain the cracks, the team (will be) performing the radius block mod around the entire tank. That extra work add(s) a couple of weeks to the schedule and cause us to miss the 2/3 window. “The rationale to perform the radius blocks around the entire perimeter is because the mottled material has been traced to lots from a ~6 month period in 2002. 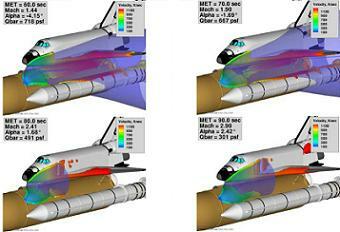 With that window, most of the stringers on ET-137 are suspect under this theory. Performing this mod to all of the available stringers on the tank could not be completed in time to meet the 2/3 window, but could be complete in time to support the late February window. “For those wondering what the heck a radius block is, it’s a repair technique pulled from the aircraft industry. 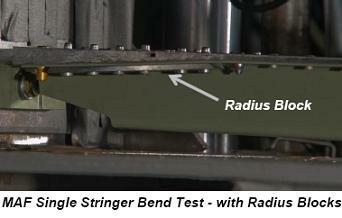 The radius block is a thin strip of aluminum applied to both sides of the stringer. 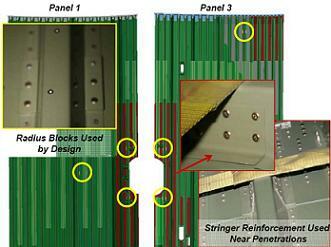 At the top of the stringer, the top 2-7 fasteners are removed. “The very top fastener is left in place because it’s too hard to get too. The thin strip of Al is then placed along that surface and the fasteners are reapplied. As far as the launch date evaluations, which MOD are heavily involved with, the overview noted the current focus is on the February 24 launch date target, given the negotiations between the International Space Station Program (ISSP) and the European Space Agency (ESA) should prove to be successful, given the relatively small change which would be required by the ATV-2 on orbit timeline – providing the Ariane 5 ECA launching the cargo vehicle launches on the opening opportunity. “While the ET team continues their work, the STS-133/ULF5 ops community should refocus their efforts on a launch NET 2/24. Previously, the next window was advertised as NET 2/27; however, the ISSP is working with ESA-ATV to modify their orbit timeline to dock on 2/23,” added Mr Lunney. Based on the February 24 launch target, the Space Shuttle Program (SSP) will conduct a delta Flight Readiness Review (FRR) on February 9, to be followed by the Agency level Delta FRR sometime around February 18. However, these dates are for planning purposes and unconfirmed at this time. All schedules point towards the successful completion of the radius block installation in time to allow Discovery to roll back out to Pad 39A with enough pad flow to achieve a February 24 launch date. (Further updates and articles will follow. Refer to live coverage threads linked above. L2 members refer to STS-133 live coverage sections for internal coverage, presentations, images and and updates from engineers and managers. 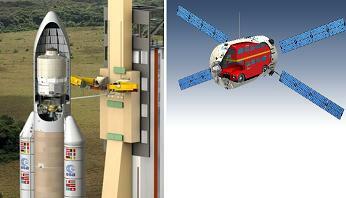 Images used, NASA.gov and via L2 acquired PRCB and ATV-2 FRR presentations).